Imports were up, production down in the EU last year. a trend that will grow with Groningen being cut further and the UK set to leave in March 2019. 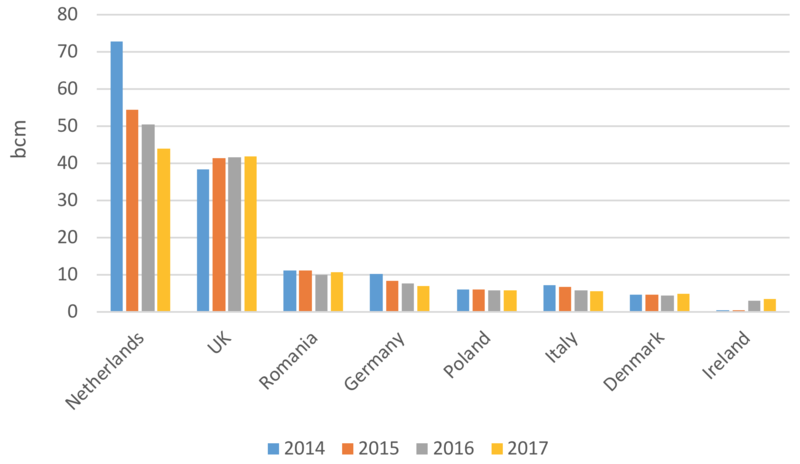 Statistics from the Joint Organisations' Data Initiative  has just been released and for the third year, EU gas demand was up (+4%) while domestic production was down by 4%. With imports up by 7%, EU-28 foreign dependency now stands at 74%. Gas demand was up in 2017 in all major markets except in the UK, where after a massive growth in power generation in 2016 (+36%) when gas boosted its price advantages over coal, the continued small growth in power generation (+4%) was not enough to compensate for falls elsewhere, leading to a drop (-2%). EU 2017 gas demand is now 17% above its record low witnessed back in 2014. Greece, which is getting out of its deep economic recession, recorded the highest growth (+21% in 2017 vs 2016) and even managed to beat its 2011 record. In aggregate, EU-28 and EU-27 gas demand are up by respectively 4% and 5%. 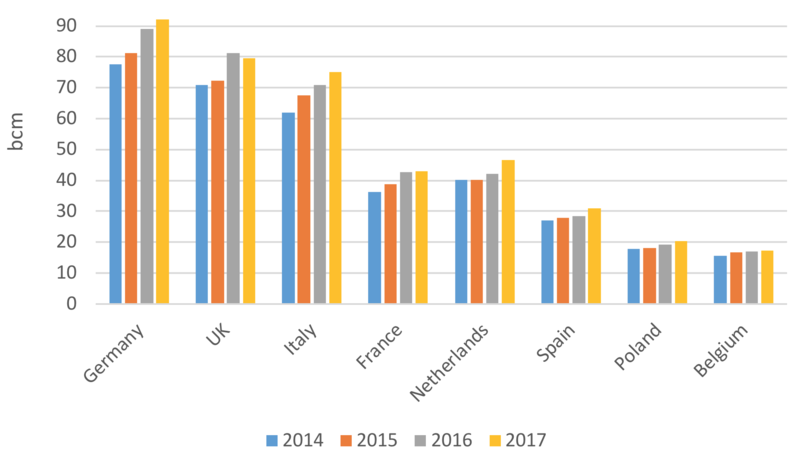 On the production side, Ireland and the UK are again up in 2017 (respectively by 13% and 1%) but this doesn’t mitigate the drop in Groningen production (-13% for the Netherlands). 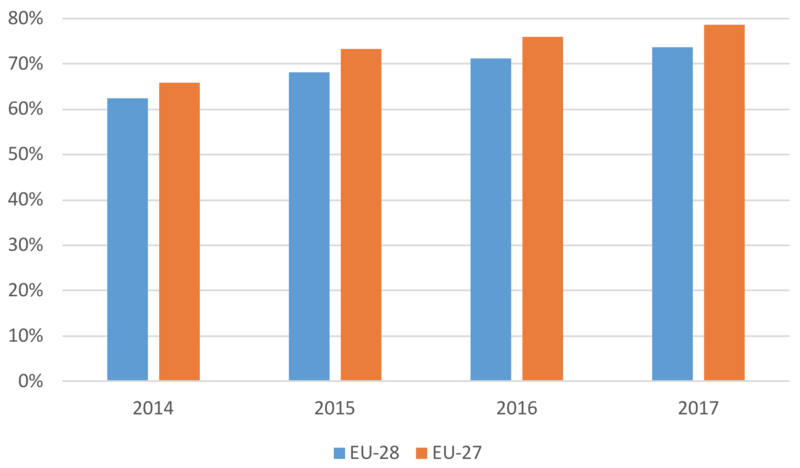 In aggregate, EU-28 and EU-27 gas production are down on 2016 by respectively 4% and 7%. This means that imports are up by 7% with EU-28 foreign dependency now at 74%, compared with 71% in 2016. With future demand slightly up – if gas is to continue to displace coal – and little hope of slowing down the decline of domestic production with no material shale production, EU foreign dependency should continue to rise in the coming years, and go above 80% when the UK leaves the EU.